1. Someone who is not married for personal reasons or as a religious commitment or promise: James and Jane dated each other for two years in high school and they pledged to stay celibate until they were married and they were very thankful that they remained celibate because after they discontinued their relationship, they married different partners when they got older. After her fiancé was killed in an automobile accident, Susan vowed to remain a celibate for the rest of her life. 2. Anyone who is totally lacking in romantic attachments to any members of the opposite gender or even those of the same gender: The hermit lived as a celibate, isolated from contact with other people and living totally alone on a small island. There are some adults, for one reason or another, who figure that the disadvantages of marriage outweigh the advantages and so they are celibates, in that they never marry; however, those who live with someone of the opposite or the same gender without marrying, do not necessarily live as celibates. 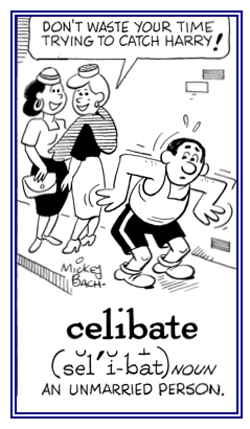 Although the primary meaning of celibate is "unmarried", no one should with any logical basis refer to a single man or woman as being a celibate simply because he or she has made no legal marital commitments. Only that adult who persistently avoids, or is denied, all romantic encounters with the opposite, or the same, gender may be called a celibate. 4. Etymology: from Latin caelibatus, from caelebs, caelib-, "unmarried". © ALL rights are reserved.